The Southeast Missouri State University baseball team takes on University of Tennessee - Martin. The game will also be broadcast on ESPN+ and Real Rock 99.3 FM. The Scott City First Assembly of God Church is having Fish Fry for the SE Angels Pageant. Cost is Adults $10.00 for 12-up, $5.00 for 6-11 years old, Free for 5 and under. Featuring Kenneth Boulton & JoAnne Barry. 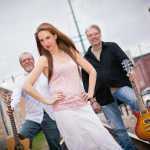 Old Cape Road will play in Keller's from 6 p.m. to 10 p.m. Come enjoy great music!